I recently attended a goal setting seminar with a few friends the other day. We discussed a few short and long term goals, made adjustments if they weren’t specific enough and then began with strategies on how to accomplish them. Here’s a short list of goals I made in January. 1/3 of the way there. After last weekend, I added to my list for the year, widening my horizon to both professional and personal goals. 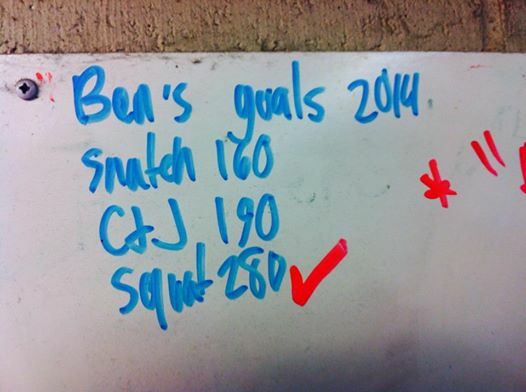 I was instructed to keep a few people in the loop with my goal progress, so I’ve decided to use you folks. 1) Create 5 more national caliber athletes this year. They might not be ready in time for nationals, but I’ve got a solid group right now very capable of hitting qualifying totals. 2) Run 5 more seminars this year at various gyms. I just ran a clean and jerk seminar with my friends a CF MVMT last weekend, so I just need 4 more. 1) Put 2 more of my sketches/designs on a T-shirt. 2) Perform at an open mic night of some sort. I picked up the guitar again and have been fiddling around and going to a BUNCH of shows to kind of see what other people are doing.